It’s time to play the music, it’s time to light the lights, it’s time to revive the franchise on the Muppet Show tonight. Let’s face it, things haven’t been going very well for the Muppets in the last few years with the financial bomb and mixed reviews of Muppets From Space. Lately everybody’s favourite frog, pig, bear and whatever have been relegated to the occasional Christmas special TV-movie. But that was before Jason Segel stepped in. The Muppets plays like a direct sequel to The Muppet Movie, with Segel and Stoller’s screenplay taking the franchise back to its roots in a good old fashioned road movie. The film follows Walter, a die-hard Muppet devotee, determined to save the Muppet Studios from Chris Cooper’s oil-drilling villian. With help from brother Gary (Jason Segel) and Gary’s girlfriend Mary (Amy Adams), they track down Kermit and set about getting the gang back together to save the theatre. This is pure-hearted Muppet goodness to the core. 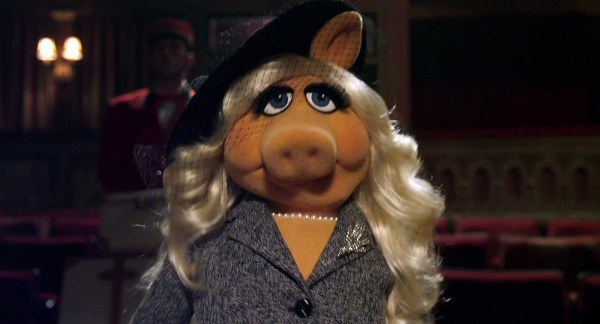 The tone of the movie is pitch perfect, with the Muppets out of their depth in a world of sleaze and reality TV. Our only Muppet complaint is the total, utter lack of Rizzo, which after years of service doesn’t seem quite fair. The human cast is up for anything and fully embrace the fun. Adams is particularly excellent and turns the silly right up in her big numbers. Segel is also in his element, living out what seems to be a Walter-esque dream of playing with the Muppets. Rashida Jones and Chris Cooper bring some not-so-seriousness to the silliness, providing a bit of balance. Sort of. As for our felt heroes, they never fail to deliver the goods so let’s not even go there. The movie doesn’t skimp on its guests either so keep an eye out for… everyone. The music is joyous and funny, thanks mostly to Bret McKenzie; “Me Party” being among our favourites with “Life’s A Happy Song” and the Oscar-nominated “Man or Muppet” coming in close behind. Overall, the only reason you could have for not going to see The Muppets is if you hate joy. If that’s the person you want to be, skip this movie. Otherwise, what the hell are you waiting for? God knows, we’ve waited long enough after the States to get it. The Muppets opens in Ireland and the UK on Friday Feb. 10th.